The piece is ready for delivery after attaching a ribbon or piece of leather for hanging. I etch with an awl on the back of each finished painting on slate with the date and: slate recovered from St. George's Church, Fredericksburg, VA.
A friend commissioned this piece for a mutual friend of ours. Since the receiver of the gift is a native Fred Girl and a member of St. George's, it seemed appropriate. What you see here is a stage somewhere in the middle of the piece. I have drilled a hole in it for hanging and printed the image from one of my hand cut blocks onto the slate in white acrylic paint. The sky is blue, as it always should be during the day in Camelot, and a Carl's ice cream cone has begun to appear in the left hand corner. I'm still finishing details on my new pendants --evidenced by the flag flying on above-- but I'm happy with these first attempts. I try to let the shape of the small pieces of slate suggest what I will paint on them. Several broke in this curved way, so they seemed to me to need beads painted on them. I am stringing them on a relatively fine cotton cord and adding glass, porcelain and wooden beads (which I had way too much fun shopping for!) Anna also donated some beautiful, large, iridescent glass beads to the cause. They are great because their holes are large enough for a double strand of the cord to pass through. Thanks, Anna. I'm hoping to have a few finished slate pendants to debut this weekend at the open house. I could spend all my time doing these fun little pieces. Someone must remind me that I have a commissioned portrait that I need to be working on! Here are a few of the pieces I worked on today. Most are still in process. Some are destined to be pins, others will be pendants and still others plaques to hang on the wall. Sales have been good, so I need to work hard to have new things and plenty for LibertyTown's Holiday Open House this Saturday. More later...gotta paint! My work was WAAY over my head. It is the top piece on the wall there. Thursday night, December 11, my family and Ariel, who also had work in the show, splashed our way up I-95 to Alexandria to see our work at the Torpedo Factory. The gallery was surprisingly small, but that was just right for the showing of small works that it housed. In the days before the opening, I tried to imagine what the show would look like hanging on the wall. I knew already that about 600 works had been submitted from the show and that about 240 had been selected. I sort of assumed that they would be jammed in with no space around them and would be hard to identify separately. I was so wrong! Immediately, I was impressed with the griding on the wall, in what looked like a blue pencil. You might think that it would give a regimented look to the place, but the pencil markings were faint enough and the groupings of work were so interestingly chosen. I talked to Mary, the coordinator of the show, and incidentally, the contact we had with the Torpedo Factory for their traveling show in the LibertyTown Main Gallery in September. She said that her assistant had created the postcard for the show in a grid which had staggered boxes filled with the work. 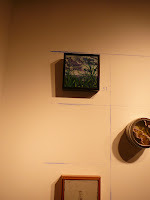 It gave her the idea to draw a grid on the walls in their gallery to hang this show. It was stunning. The work came from 30+ states and 6 foreign countries, including Israel. In the main, work was innovative and provocative. It was inspiring, and I am so glad we went. My camera battery died while taking photos of the work I had done today. Early, I cleared the decks of all the piddly stuff which must be done: labeling, inventory, packaging .... and finally got to the part I have been meaning to get to all week, which is to work on some new card designs. I used sticky fun foam and scraps of backing board and had fun playing with shapes. Then I had fun playing with colors and printed up some new all occasion cards and a few birthday ones. Art Talks and Carol Kramer Rocks! Stafford Schools art teacher Mrs. Miller brought her Art Talks students to LibertyTown on last Saturday. Everyone ate lunch first, since they'd already been to Belmont, and then watched a pottery demo from Dan. The groups were large, so while they waited for the demo, they split into smaller groups and talked with various artists working in their studios. The outing ended with a scavenger hunt throughout the whole building. The kids were curious and asked great questions. They were great visitors! Desiree makes notes about one of my paintings. Ms. Kramer teaches a Humanities 100 class at the Fredericksburg area campus of Germanna Community College. She gave her students a terrific assignment this semester. They were to come to LibertyTown and interview three artists whose work they liked. They asked how the work was created; what inspired the artist, and any other questions that popped up in the conversation. I have probably spoken to at least ten of her students within the last few weeks and have really enjoyed it. They were universally surprised to find out what kind of place it is and amazed to find the arts and artists so approachable. Just a quick note to show the changes in the main gallery at LibertyTown, and to say that our Friends of LibertyTown came out ready to shop last night. We appreciate their warm reception to the changes and their presence last night for the preview. 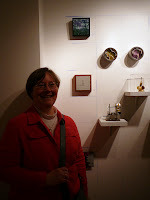 We also opened Small Works by LibertyTown artists. See a sampling of those displays below. Such a whirlwind has been whipping around Libertytown this week! Dan and Beth (with help from Elliot) built a roomful of Ikea furniture. Said "build-it yourself" (BIY???? ), superstore was alternately praised and cursed all the day long. The most exciting thing that happened yesterday was the explosion of glass from a cabinet door which had already been installed. Thank goodness no one was hurt. All was cleaned up quietly and quickly, and Dan picked up a new door along with more boxes of furniture to put together. It's a big room. Today, as the day progressed, the gallery began to take on the look of a fancy museum gift shop. Susan wafted from place to place creating magic out of the hodge podge of fine art and craft left by various local artists, including those from Libertytown. When she is done, the place is going to be gorgeously ready for the December shoppers. Beth, Aline and I will hang the Small Works show beginning tomorrow, and then Thursday night will be a preview opening for the Friends of Libertytown. They are in for a real treat. If you are in town, join us First Friday, Dec. 5th from 5-9. The Pottery Students will be selling their work, too. Don't miss it! See the link at right for directions. Two color reduction print shown above is Rear Window, one of my new works which will be on display. 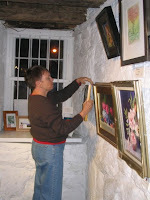 Yesterday afternoon and into the night, wonderful members of the FCCA (Fredericksburg Center for the Creative Arts, http:// www.fccava.org) volunteered to help the Members' Gallery Coordinator (that would be me) take in art for the annual Members' Holiday Art Show and Sale, and put it up on the walls. What would I have done "all by my onesie," as Cap'n Jack Sparrow says? Thanks to Nita, Shirley, Lynette, Darlene, Bev and Carol, folks I knew were coming, and Susan, Gary, and Lois who pitched in to help because they were asked and needed. You guys are the best!